Three times a week, I go out running around a path that I made around three of my soybean fields. Not a single day goes by that I don’t think about the connection between this land and my family. Earth Day is a day when we all think about the environment, when we look at how we take care of the land and how to leave it in better condition than we found it. Every day is Earth Day to a farmer. Taking care of the land is my job and my passion. My land is my heritage, my inheritance, my business, my recreation, my safe haven, and my retirement. No one poisons the well they drink from, and farmers are no exception. Good, clean, productive land is how I feed my children and will put them through college. I may have a piece of paper that says that I own the land, but I know that I am only a caretaker. The land was here long before me, cared for by many generations. I expect it will be here long after me, cared for by my children and their children. Maryland farmers, as a group, are the most progressive and environmentally minded in the nation. This year, we once again broke the record for cover crop acres planted – one of the most effective ways to protect both our land and the Chesapeake Bay. We’re far ahead of other milestones set for the Bay, too, including planting streamside forest and grass buffers, retiring highly erodible land, and constructing storage for animal manure, which is an important source of organic nutrients for our crops. We’ve got soil conservation and water quality plans on half of Maryland’s tillable acres and have embraced the manure transport program, moving four times the amount of manure than the goals prescribed. I often hear, “Sure family farmers take care of their land, but what about corporate farms?” I don’t know of a single farm that isn’t a family farm (and I know a lot of farmers). 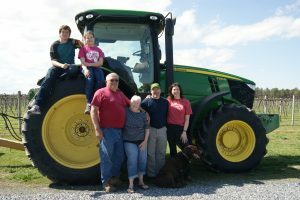 Family farms – owned by brothers, by a father and son or daughter, by a husband and wife, or by cousins – often will incorporate for legal or financial reasons. The USDA says that 97 percent of farms in the United States are family-owned operations. Sometimes these farms are large, because farms, like every other business, have to grow to survive. You can’t go out and make a good living on 100 acres like you could in my grandfather’s day. Today it’s more like 2,000 acres or more for corn and soybean growers. How can farms that large take care of the land adequately? Technology and innovation. Today it’s possible to do a better job with 3,000 acres than my grandfather could with 100. We no longer have to plow the land, which destroys the structure and biology of the soil and leaves it open to erosion. GPS technology allow us to treat every single acre individually. Ask a farmer anything about his land, the littlest detail, and he’ll know it. Ask where there are problems with grasses, or pigweed, or marestail, and he’ll know. Ask where the wet spots are, or spots that get as hard as concrete in the summer. Ask where water runs off the land, and where it will pond up. A farmer knows his farm like the back of his hand. Most will tend every acre four or more times a year, planting, scouting, fertilizing, killing weeds and harvesting. My family has owned the farm I live on for 68 years now. Three generations of Laytons have all been raised in the same house, on the same land. When I watch the sun rise over the fields each morning, I know the only thing more important to me than my land is my family. Enjoy Earth Day, and make a pledge to see firsthand how farmers make every day Earth Day. We welcome you to visit our farm, or suggest MarylandsBest.net to locate farms near your home to visit, where you can see land and water quality efforts in action. William Layton, his wife Jennifer and his father Joe raise soybeans, corn, wheat and grapes on a 1,300-acre farm in Dorchester County, MD. The family opened Layton’s Chance Winery in 2010.